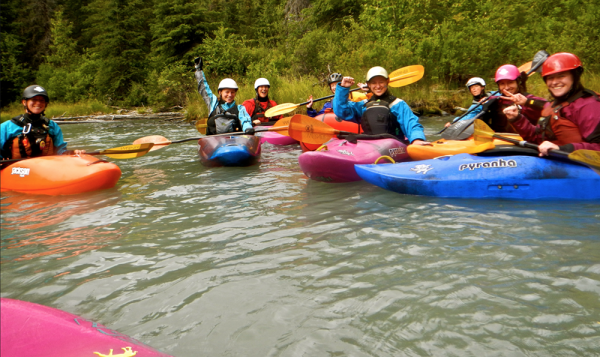 On Sunday, August 10th 2014, I organized and brought together a group of 10 amazing women, few of which knew each other, to paddle Six Mile Creek in Alaska. Six Mile is a beautiful river located on the Kenai Peninsula, that offers class II-V rapids. Females of all abilities were welcome and thats exactly what we got! There was a wide range of experience from beginners to expert whitewater kayakers that joined on the sections they felt comfortable paddling. We started off the day with a couple miles of some class II whitewater that leads into the first canyon. Here ladies who just jumped into kayaking for their first time fought their way through the currents while others practiced rolls, pealing in and out of eddies and learned tips on paddling technique. When we got to the first canyon, we all got out to scout and talk about the rapids. Myself and a few other ladies with more experience shared knowledge of how and where to run rapids. Every female made the decision for themselves to portage or kayak the first canyon. A few took a jump and ran some rapids in the first canyon that pushed them, while the more experienced kayakers guided and set safety. In such a male dominated sport, it was truly incredible to be out there in such a large group all supporting each other. The vibe was supportive to all. The ladies pushing themselves, felt comfort and stoke in this supportive environment of badass ladies. After the first canyon, half the group continued through the class IV rapids downstream through the second canyon. Then onto the 3rd canyon with a handful of ladies. It was an empowering feeling to be out there is such a powerful, dynamic force of nature hooting and fist pumping through the rapids one after another with amazing women. We were all pumped!!! Everyone was extremely excited and empowered from their accomplishments, whether it was getting into a whitewater kayak, running difficult rapids or helping others. 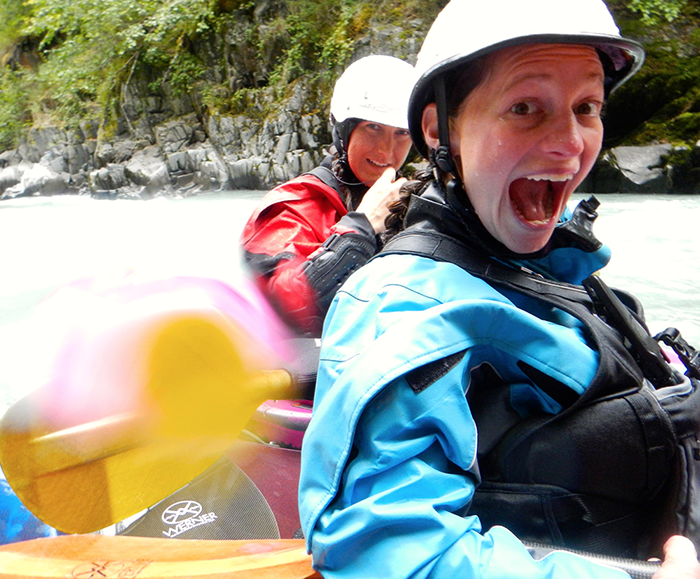 Connections and friends were made that day that allowed these women to continue to get out on the river with each other to gain the experience, knowledge, and confidence needed to continue pushing themselves in this badass sport called whitewater kayaking. 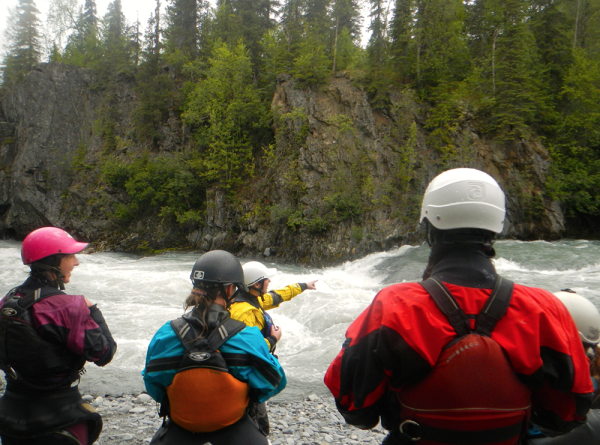 This past Tuesday, 13 Alaskan women came together for a whitewater kayaking roll clinic that I organized taught. It turned out to be an extremely warm, gorgeous day! Who would have thought I’d be with a group of amazing women wearing bikini’s in a lake in Alaska rolling kayaks? Not me! Not in bikinis at least! But there I was and I was pumped to teach these girls the basics of whitewater kayaking. 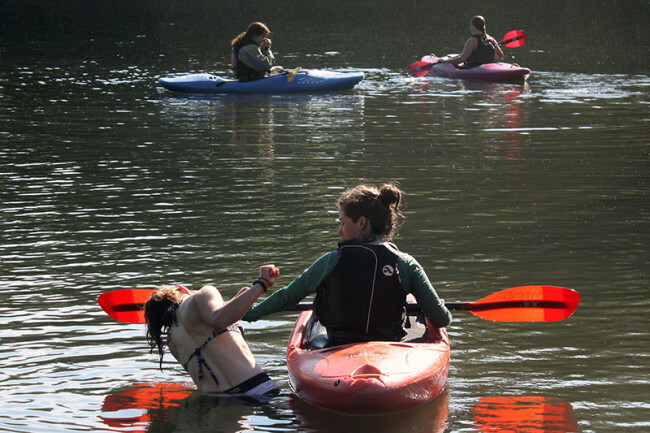 We started off the clinic by learning how to properly outfit yourself into a kayak. From there we all got on the water and learned different paddle strokes, plus when to use them on the river. After paddling around the lake for a bit, we partnered up and learned how to hip-snap, the key element in rolling a kayak. Once we got use to this, we progressed into flipping up-side down in the kayak and hip snapping from there using our hands on our partners boat. From there came the roll. There were 3 other instructors (Kelly Rinck, Liz Powers & Tracy Kulesa) there to get in the water and help each lady work through the steps of rolling. The clinic was a huge success, all of the ladies were really excited to have the opportunity to do this. Plus, they were able to take a jump and push themselves in a comfortable & safe environment to do something rather intimidating.